A year ago, sixteen scientists wrote an editorial for the Wall Street Journal to explain that there is “no compelling scientific argument” for “drastic actions on global warming”, despite the fact that the media continues reporting there is “incontrovertible” proof otherwise. One of those scientists is Dr. Roger Cohen, who spent over 40 years in industrial research in the electronics and energy industries and was the Senior Director for Exxon’s Corporate Research Laboratories and Manager of Strategic Planning and Programs. At the time of the opinion piece, he was a member of the Executive Committee of the American Physical Society’s Topical Group on the Physics of Climate. And the reasons for his resignation show how pure science is being repressed in favor of pushing an “incontrovertible” political agenda. It’s like Galileo, but with the pontiffs heading “global warming theology”. The American Geophysical Union and the American Meteorological Society have shed their traditional roles as supporters of science inquiry in favor of out and out advocacy. It is also widely known that scientists seeking to publish opposing scientific evidence experience great difficulty getting papers published in journals sponsored by these societies and others. However the American Physical Society (APS) – the second largest society of physicists in the world, and my “home society” – had stopped short of this level of shrill advocacy and bias. Physicists, perhaps more broadly trained in their relatively mature field and having a somewhat broader perspective than some other science practitioners, might be expected to adopt a more hands off stance when it comes declaring a complex and difficult science question “settled.” And indeed this was the case…until the 2007 Statement on Climate Change was issued. Cohen then spear-headed a petition drive, which produced a request for the Climate Statement to be moderated that was signed by nearly 300 physicists (including nearly 100 Fellows of major scientific societies, 17 members of national academies, and two Nobel Laureates). Instead of modifying the fear level in favor of science, the APS simply added 750 words the statement explaining what the original 157 words really meant. At that point, some APS members quietly resigned or let their memberships lapse in response to the lack of scientific seriousness. The most publicly visible of these resignations were Nobel Laureate Ivar Giaever and distinguished APS Fellow Hal Lewis. For example, one accomplished physicist, an expert on the key issue of solar variability effects on terrestrial climate, was shunted off to “back up speaker” status due to the intervention of an IPCC lead author with a demonstrable vested interest in the IPCC’s posture on the solar issue. Another proposed speaker’s peer-reviewed, published work concerning the integrity of the land temperature data was completely discounted because he had endorsed a public expression of religious faith and its connection with science. So, when some eco-activtist says the science behind climate change is “incontrovertible”, Cohen’s story shows what that word truly means. Bu-but al jazeera gore, just pilfered a 100 million.. The U.S. deficit is the only incontrovertible evidence that I can attest to. Global warming is the hoax that keeps on taking – the redistribution of global wealth to fix a non-existing problem. It’s the opposite of never having a land war in Asia. Inconceivable! Any laws/policies this government puts in place to reduce carbon emissions will result in a net increase. Conversely, if they set out to promote carbon emissions, it will almsot certainly result in carbon reductions. You know, whores are more honest than scientists these days, especially the ones who remain in charge of scientific bodies after the honest men quit. At least the whore would be wiling to say she’s faking it. These guys, these hacks, know their quackery but would foist it upon us just so their communist agenda is realized. There is no truth but their truth, no god but their allah, global warming. Tar and feathers. …sometime in that 2 hour window where reruns of the Daily Show and Big Band Theory aren’t available on cable. There actually ARE “Scientists” with a backbone. For Dr Cohen, I remove the quotes; he is one. I am a PhD in Engineering–which is applied Physics. I don’t claim to be a Scientist–in that I spend my time making things work as opposed to trying to discover stuff. From a training viewpoint, lots of overlap. It is more how you make your living. One of the things that ALWAYS raises my hackles is when words like “Settled” and “Incontrovertible” are used in the same sentence with “Science”. I usually quit reading, lest my blood pressure redline. THERE IS NO SUCH THING AS “SETTLED SCIENCE”. In every area, there is a lot more we don’t know that what we do. It’s like Galileo, but with the pontiffs heading “global warming theology”. That ain’t necessarily so. Rather, it’s like Galileo, an academic pushing a theory he couldn’t prove and insulting those who weren’t solidly in his camp – even friends, and with the pontiffs insisting that he stop teaching his unproven theory as settled science. Meanwhile, responsible academic churchmen (Jesuits, mostly – ever heard of Clavius crater on the moon? It’s named after one of them.) were working hard to devise a correct theory (Kepler and later Newton would beat ’em to it, but they and a lot of other smart people were in the race). That’s right, just like today’s Mr. Hockey Stick Graph, Galileo was wrong. You can look it up. Galileo thought the sun was in the center of the universe (it isn’t) and planetary orbits were perfectly circular (they aren’t). Nor could he explain why people didn’t get flung or blown off an Earth whirling around at 1000 miles per hour (yes, Catholic churchmen knew the Earth was round). Nor could he explain why, if Earth moves from one side of the Sun to the other side then why don’t the positions of the stars appear to shift in the sky. And Galileo’s attempts to prove heliocentrism by the arguments in his books were bad physics. Any good history of science professor can explain it all to anyone who cares to look into it (Monty Python movies may be hysterical fun but they’re not historical fact). But bashing the Catholic Church is so much fun, why would the malinformed want to stop? There is so much urban legend that masquerades as historical fact. The “flat earth” stuff is one of them. While in times past, the vast majority of people were illiterate and uneducated in today’s sense there NEVER was a time that thoughtful people didn’t know the earth was round. The ancients even had a pretty good idea as to its circumference. The idea that we are oh-so-smart and that medieval peasant was so stupid that he couldn’t develop the idea the earth being round was a good explanation for why things disappear below the horizon is an “ism” of some sort. Like it or not, during the Middle Ages, the keeper of knowledge were the Catholic Church. Yes, there were people that insisted the earth is flat. We have all sorts of nut cases today. The problem is sorting out which ones are nuts and which ones are right. The guy (forget his name) that developed the idea of continental drift was ridiculed for decades, today it is the “accepted” THEORY. The “flat earthers” of today are the people that insist on “settled science”. Ah, for the good’ol days when science was a pursuit, not a cult. Are you calling “environmentalism” a cult? Whatever in the world could give you that impression? Science plugs along just fine. The problem is that political activists (the folks back in school who avoided STEM subjects because of the work and discipline) finally figured out that the word ‘science’ carried a lot of respect. So they hijacked it for their own use as term of Authority, and claimed that it was on their side. All too often us so called “conservative” simply react to a specific issue, failing to see how it correlates into a greater agenda. To enable a select few to have utter and complete control over everyone else. 1. The justly eminent Freeman Dyson gave most cogent assessment I’ve seen. 2. The West continues its suicide by stupidity (for the benefit of the intelligentsia! ), but no worries: if there turns out to be a problem in a few decades, the Asians will fix it. Snarkiness aside, I don’t think the climate is understood well enough to be confident one way or the other. That being so, I’d put humanity’s chips on economic growth and the corresponding technological advances, including climate engineering if indicated. Let’s be practical: the people who have started suppressing the truth, can’t afford to ever stop – they’d lose their jobs, if not careers. So – the only solution is to start new, parallel groups for scientists to publish/meet in, and let the old ones fall apart, as they struggle to cope with what the new groups are publishing, and what the simple environment shows is happening. It’s never pleasant when I remind a boomer Leftist that most of his kind once sported bumper stickers that said “question authority” but now have become the authoritarians. If they’re angry or ashamed, I suspect they’re low on the leftist totem pole. The bigwigs understood all along that Question Authority is just something you say to get power, like Elizabeth Warren faked being Cherokee; to call them out on it labels one as stupid or an enemy. A little known scientific study (little known because I just made it up) has shown a direct link between global warming and grant money to study global warming. I’m old enough to remember when Rachael Carson’s book ‘Silent Spring’ was published and became the darling of all the environmental whacko’s and morphed into a political issue resulting in the banning of DDT nearly worldwide. The “incontrovertible” proof in the book (since proven false) has resulted in countless deaths caused by malaria. The sad thing is that, like ‘global warming’ once the powers that be decide that anything that is labeled as “incontrovertible” can be used to take away our freedoms and line their pockets, they pounce on it like the vultures they are and the rest of us are left with another seemingly impossible mountain of oppression to overcome. Global warming is real. We’re coming off of an ice age. However, the scale of that warming is so slow that it won’t be measurable against the background noise over the course of several human lifetimes. CO2 is an active molecule, but it is not, and never has been reasonably characterized as a “major” greenhouse gas. That’s because there is not enough of it in the earth’s atmosphere to make a difference. Further, both long-term studies and the several-decade weather trends data gathered during our lifetimes indicate that increased CO2 concentration is unrelated to temperature patterns, probably, again, because the net amount of CO2 is insignificant compared to that of the major greenhouse gas. The major greenhouse gas is water vapor. You can get a demonstration of the effect every time a cloud moves overhead. The opposition to the notion of anthropogenic global warming came immediately, and still comes, from experimental scientists of all varieties, including physicists, chemists, and engineers. The claims made by the global warming alarmists suffer from scale problems: they claim to find meaningful data in experimental noise, and their theories are based on the presumption that insignificant factors outweigh those of controlling factors. And then there is the problem of the way they faked the data after it failed to prove their theses. 1. Here is an older manifesto calling for action on the climate. I haven’t checked the authenticity, but it is signed by a number of Nobel Laureates. Molina said that it’s not certain what will happen to the Earth if nothing is done to slow down or halt climate change. 3. I’m not willing to bet the biosphere because the alarmists might be wrong, and I’m not willing to wreck the economy because they might be right. Per my previous comment, I’ll put my money on economic growth and the ensuing technological advances in climate engineering. Really? I am old enough to remember when we worried about the next ice age, that being the late 1970s. We have had as many years of cooling or steady temperatures as we had with warming temperatures. One theory is that good old CO2 kept us from cooling too much. Does human behavior effect the climate? Maybe, but how much? One study I read credited human behavior with perhaps 10% of the change. So if the temperature went up .5 degrees, humans might account for .05 of a degree difference. There are cycles for weather and climate. The United States, by switching to more natural gas, has lessened its carbon footprint in the last 5 or 6 years. Has anyone else? I doubt it. But warming has stopped. Don’t forget that the whole carbon exchange thing is a brilliant idea brought to us from a friend of Al Gore who happened to be an executive for Enron. Enron is that reputable energy firm ( a corporation) who really cares about the environment. I hate to come off as a crazed conspiracy theorist. But here goes. I don’t think it’s an accident that all of the Left’s pet projects: biodiversity, population growth, deforestation, and global warming require a monumental, coordinated, global response and radical changes in how we all live. No single country acting alone can make a difference. It takes the whole world acting in a centralized, coordinated manner to effect the change the Left wants. They started with Europe first. They convinced individual European countries to give up their currencies and the ability to control monetary policy to an over educated bunch of bureaucrats in Brussels. Monetary unification was the first step. Fiscal and political unification is coming next. They want a continental Super Government of central planners to control how Europeans conducts their affairs. It’s no accident that we have U.S. academics – people who ironically teach Constitutional Law – now openly advocating ripping up the U.S. Constitution. Others want to repeal the 2nd Amendment. Why? Because American ideas about individual liberty are not compatible with organizing the people of the world around centralized global collectivism. Anybody who believes in individualism, freedom, liberty and everything America was founded on needs to realize the domestic and global Left are not the “loyal opposition”. They are enemies out to destroy the very ideas America was founded on and which made us great. Your “crazed conspiracy theory” has a name. And it’s not theoretical. Sorry to go off topic, but Galileo was closer to the Global Warning Activist side of things than the pope. Galileo’s problems did not come from his belief in heliocentrism, they came from both his insistence that his unproven theory be accepted as fact. “He (Bork) told me about his astonishment as he got closer and closer to the top of the US legal establishment to discover that so much of the legal thinking there was explicitly politicised: “It’s as if you wanted all your life to be a top astronomer, only to find that many of the top astronomers in fact practise astrology”. Politically Correct is just a code phrase for Punitive Conformity. As one who has a “little” training in meteorology, I can state with some confidence that this whole global warming/climate change hysteria IS human caused since it IS humans that are spreading the hysteria. Fact is that the driver of climate change has always been the sun and any attempts by mere mortals to alter the natural course will be at best futile. While I’ll admit that “human activity” may not be helpful it is hardly the driving force of climate change. It is the Al Gores of this world that are seeding the deception where I fear the real goal is to simply line their pockets with our money. The next time that someone wails on about global warming, ask them why adjacent planets are also warming? 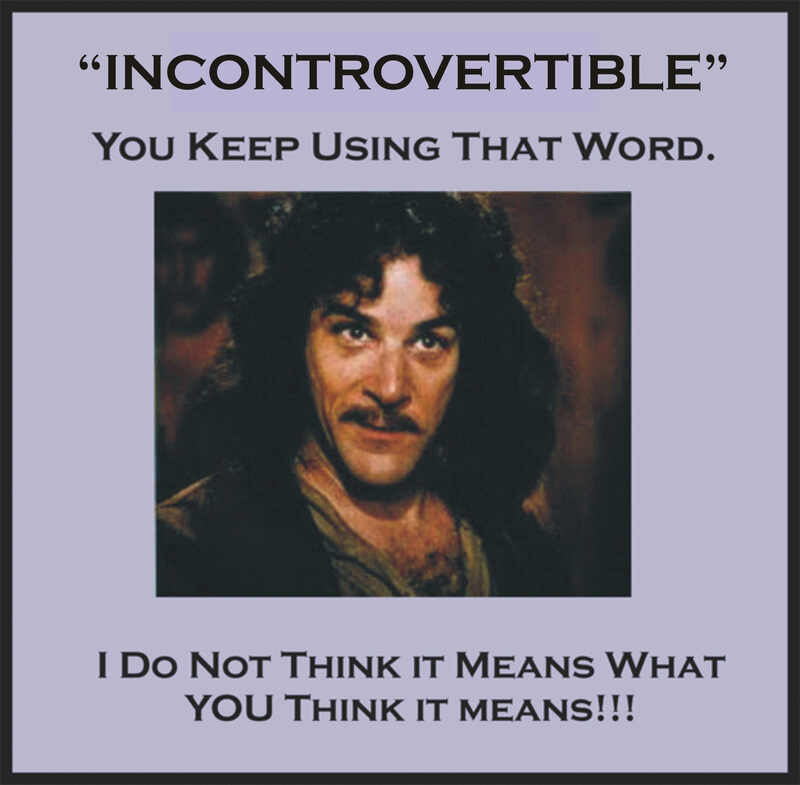 While the APS should have avoided using the word “incontrovertible”, eppure si riscalda. Myopic conservatives and the media still don’t get global warming. But if anybody can preserve a livable climate, Obama’s amazing energy team can. The exact same process they used against tobacco users and for prosecuting a war on drug users as well as many other campaigns waged ‘for the public safety’. Why do the masses who still believe all that evidence used to justify government intervention those areas is incontrovertible but now that it may be affecting them, they are starting to doubt the ‘experts’ and official narrative? Dr. Cohen and the other dissenters need to start their own society and/or journal.